In a breather to controversial Gujarat IPS officers -- D G Vanzara and P P Pandey -- a special Central Bureau of Investigation court on Thursday granted them conditional bail in the fake encounter killing case of Ishrat Jahan and three others who were branded by the state police as LeT terrorists. Special CBI judge K R Upadhyaya allowed the bail applications of Pandey, an officer of Additional Director General of Police rank, and Vanzara, after placing stringent conditions for their release. “Application (for bail) is allowed,” the judge said, rejecting objections from the prosecution, which contended that the release of Vanzara, whose stint as city Crime Branch and Anti-Terrorism Squad chief had seen sudden spurt in extra-judicial killings, could be an “open challenge” to the civil society. The officer, who retired under suspension while in jail in connection with the Sohrabuddin Shaikh, Tulsiram Prajapati and Ishrat Jahan fake encounter killing cases, has been barred from entering Gujarat but ordered to mark his presence before the court every working Saturday. He has also been prohibited from leaving the country. Vanzara will walk out of jail after spending nearly eight years behind bars since his arrest in connection with Sohrabuddin Sheikh case on April 24, 2007 after furnishing a personal bond of Rs two lakh. The same court earlier ordered release of another suspended IPS officer P P Pandey, who has been in jail in the Ishrat Jahan case for 18 months. Like Vanzara, Pandey, an ADGP rank officer, has also been asked to surrender his passport and not to leave the country without the court's permission. Pandey, who was the city's Joint Police Commissioner during the 2004 encounter killing, was ordered to be released on a personal bond of Rs one lakh and two sureties of the like amount. He was also directed to appear before the CBI court every Thursday, not to tamper with evidence or try to influence the witnesses in the case. 19-year-old college student Ishrat Jahan, from Mumbra near Mumbai, Pranesh Pillai alias Javed Sheikh, Amjad Ali Rana and Zeeshan Johar were killed in an alleged staged encounter by a Crime Branch team on the outskirts of Ahmedabad city on June 15, 2005. Gujarat police had then claimed the deceased were members of Pakistan-based terror outfit Lashkar-e-Taiba and were on a mission to assassinate the then Chief Minister Narendra Modi. According to the CBI charge sheet, the encounter was set up by the Gujarat Police and the Intelligence Bureau. In his bail application, Vanzara had contended that he should be released on the grounds that he had been behind bars for over seven years and charge sheet had also been filed. At the hearing, Vanzara's lawyer V D Gajjar alleged that the CBI had acted against the officer with prejudice and claimed his client had “merely followed” the orders of his superiors. 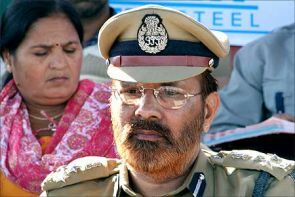 The prosecution, while opposing the petition, insisted that Vanzara's release on bail could pose a “challenge” to the civil society and that he might influence the trial. Prosecutor L D Tiwari argued that the number of years spent by Vanzara in jail could not be the ground for grant of bail as the Supreme Court had, in a similar case, ruled that enlarging an accused involved in such a serious and grave offence on bail will throw an open challenge to the civil society. In his bail plea, Vanzara had also said his name did not figure in the original FIR but CBI “vindictively” charge sheeted him. Prosecutor Tiwari contended there was nothing wrong in charge-sheeting him as his role in the offence came to light later during the investigation. Vanzara had earlier been granted bail in the Sohrabuddin Sheikh and Tulsiram Prajapati encounter cases by a Mumbai court. The Supreme Court had clubbed the two cases which are being heard in Mumbai. During the hearing of Pandey's bail plea, his lawyer Nirupam Nanavati claimed his client had been implicated in the case at the behest of another IPS officer. He also charged the CBI with bias for acting only against the Gujarat police officers while sparing those from the IB. Public Prosecutor Tiwari opposed Pandey's bail plea, saying he was a part of the conspiracy to kill Ishrat Jahan and others and that he could influence the investigation if set free.